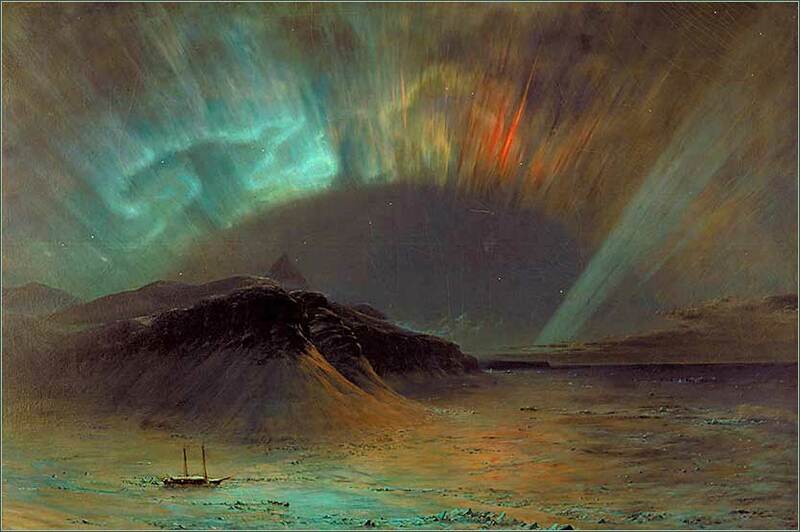 Aurora Borealis by Frederic Edwin Church ca. 1865. 273 people in our community are currently praying with you. Our “Virtual Sunday Church” takes us to the Cathedral of Saint Paul, Minnesota, for a setting of Psalm 121 (see psalm under today's Scripture) by James Biery. O God, you make me glad with the weekly remembrance of the glorious resurrection of your Son my Lord: Give me the peace to worship you with my whole heart and mind, forgetting the cares of the world, and dwelling with you for a short moment with my entire being. And give me this day such blessing through my worship of you, that the week to come may be spent in living knowledge of your peace; through Jesus Christ our Lord. I humbly beseech you, O Father, to raise me and all who confess your holy name, from the death of sin unto the life of righteousness; that, when we depart this life, we may rest in Him; and that, at the general Resurrection in the last day, we may be found acceptable in your sight. I pray that you will give us that blessing, which your well-beloved Son will then pronounce to all who love and fear you, saying, Come, you blessed children of my Father, receive the kingdom prepared for you from the beginning of the world. Grant this, I beseech you, O merciful Father, through Jesus Christ, our Mediator and Redeemer. Lord, I ask you to inspire me to encourage others by what I say and do today and throughout the coming week. God and Father of all people, never let me look down on others or make anyone feel inferior. Lord, show me how to live this week with genuine concern for others. In expressing my care, may I show people that they are valued, loved and appreciated for who they are. One of the nicest things about psalms is that they are not always meant to be morally prescriptive, theological, historical, or prophetic, but instead are works of reflection involving personal (or national) pain and joy, lament and praise. One nice thing about this, specifically, is that we often have more latitude to interpret them for ourselves. Wars have been fought over Matthew 16:19, for example; but who is going to fight a war over “The Lord is my shepherd, I shall not want/ He maketh me to lie down in green pastures”? Who is even going to get into an argument about it? For my money, nobody has ever equalled the King James Version in its translation of the Psalms; although I have completely abandoned the KJV for most purposes, every time I read a Psalm, I find myself picking up my King James Bible to compare it to the newer translation. And almost without exception, the KJV is betterSometimes the New King James Version captures the poetry without the archaic language.. Probably this is because poetry is a dead art form today but was hugely important in the 17th century. In 1610, any educated person would read poetry — good poetry — every day. They didn't have t.v., or even novels; they eagerly awaited publication of Shakespeare's next volume. So it makes sense that the KJV translators, who would have had extensive training in poetics, were simply better at writing it. Psalm 121 provides a major translation problem right off the bat. Is the phrase “from whence cometh my help” a question or a statement? You see it both ways; both ways are grammatically correct, and both make sense. But almost all later translations, which translate it as a question, damage the poetry. The KJV (and the Orthodox Jewish Bible) treats it as a declaration, which I also prefer. “I lift up my eyes” is both a literal statement and a metaphor. The author depicts himself trudging back to Jerusalem from Babylon, at the moment when he looks up from the dusty flat terrain of the road to the hills of his homeland, the place where, to a Jew, God literally “lived”. But he treats this moment as a general metaphor. First, for turning one's attention away from the immediate and towards the universal; and even more abstractly, for prayer: “lifting” one's mind from earthly concerns to God in heaven. The poem is divided into four stanzas, each of them identical in structure: two lines broken into two parts. The nature of the poem is a theme and three variations. The first stanza is in the first person, whereas the other three are in the second person, that is, addressing a listener. The poet himself goes first; we follow him. He is leading us. Say the first stanza in prose: It would be something like “God helps us out when we have problems.” Now read the first stanza, and you will see a cardinal property of poetry: Its meaning simply cannot be restated as prose. We can parse poetry to help us understand it, but we cannot capture it with prose, just as we cannot fully capture music or painting with words. All four stanzas employ the fundamental poetic device of the Hebrew psalm, called “parallelism”. The two parts of a line are directly related to one another. The second phrase might be a restatement or variation of the first (“The Lord shall preserve thee from all evil:/he shall preserve thy soul”); it might answer a question the first asks or implies; it might be the result of the first (“The Lord is my shepherd/I shall not want”); the two phrases might be different examples of some general rule (“Blessed is the man that walketh not in the counsel of the ungodly/nor standeth in the way of sinners . . .”). There is no limit on what the relationship is, for that is the art of the psalmist. The beauty of the relationship was the key to a Hebrew listener's enjoyment of it. The principle of parallelism is applied not only within a line, but also to two lines, to two pairs of two lines, and even (as in Psalm 121) to four-line stanzas. For example, “He will not suffer thy foot to be moved” is itself a lovely metaphor, and it is restated in the first part of the following line, “Behold, he that keepeth Israel . . .” Sometimes a psalmist will use an “A-B-B-ANo, the psalms have nothing to do with Swedish disco music. Focus!” construction. Look at the first stanza, for a connection between the first and last line, and between the two middle lines. Let us apply these rules to the third stanza. The overall theme — God as our guardThe Hebrew verb root for “keeper” has many possible translations: guard, protect, defend, watch over, etc. — is a more specific example of the overall theme — God helps us. The second phrase restates the first as a metaphor, God as a sort of umbrella. The second line then elaborates on the metaphor in two parallel statements, one about the sun and one about the moon; but taken together, they relate to the previous stanza and the concept of God neither slumbering nor sleeping, because taken together the sun and moon cover the entire 24-hour day. We are way past our maximum word count for the commentary section; I hope you will read the psalm closely several times and look for the connections between all of the components. James 1:19-21 (NIV): My dear brothers and sisters, take note of this: Everyone should be quick to listen, slow to speak and slow to become angry, because human anger does not produce the righteousness that God desires. Therefore, get rid of all moral filth and the evil that is so prevalent, and humbly accept the word planted in you, which can save you.